Every year, my parents, my brothers and I travel to my grandparents' house to celebrate Christmas. Even now that I am living in London with Joe it is still the most important thing in the world that I get to be with my family over the holidays. There are so many wonderful traditions we have been celebrating for the past decades which I would never want to miss. One of the things I have always looked forward to was the selection of 15 or so different Christmas cookies my Nan used to make every year (tons of each one). They were delicious, looked perfect and no one was ever able to stop nibbling them. Unfortunately my Nan passed away this August and it is now up to us to keep up this tradition. I have decided to edit a little baking book in memory of my Nan, including all her favourite recipes and I will be sharing them on the blog, too. I'm starting with one of my personal favourites: Cinnamon Stars. Start beating the egg whites until they just turn white and gradually beat in the icing sugar until you have a creamy, shiny mixture. Take away half a cup, cover with cling film and put it in the fridge. 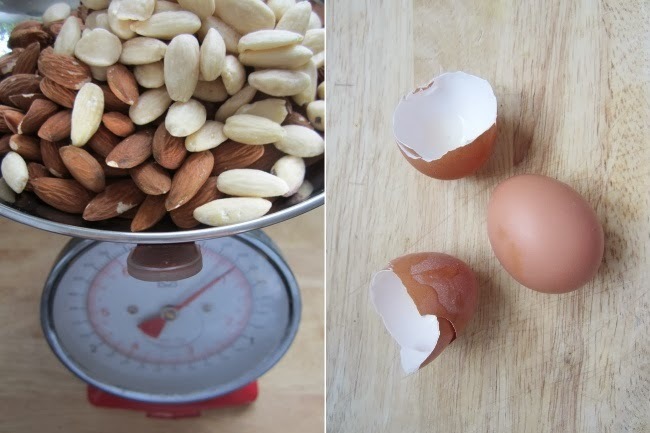 Now stir the ground almonds into the egg and sugar mixture until well combined. Cover with cling film and place in the fridge for 2-3 hours. Once the time is up, cover an area of your kitchen surface with some plain flour, take the dough back out of the fridge and start kneading it on the floured surface. With a rolling pin, roll out the dough until it is about 6-8 mm thick, if it is too sticky use some more flour. Take a star shaped cookie cutter and start cutting stars out of the dough. Place them on a baking tray and bake in the oven at 130°C for 20 minutes. Once the 20 mins are over, cover the cookies with the remaining egg-sugar mixture (which you had placed in the fridge earlier) using a brush and place in the oven for another 10 minutes. Done! TIP: If you want to store the cookies in a tin, add a few pieces of sourdough bread or a few slices of apple to keep the cinnamon stars from drying out!